Today in History–October 2–the Library of Congress features Revolutionary War officers Major John André and Brigadier General Benedict Arnold. On this day in 1780 André, a British intelligence officer, was hanged as a spy after being caught with papers concerning Arnold’s treasonous dealings. Only a short time before, the Continental army general had agreed to surrender West Point to the British in exchange for 20,000 pounds. 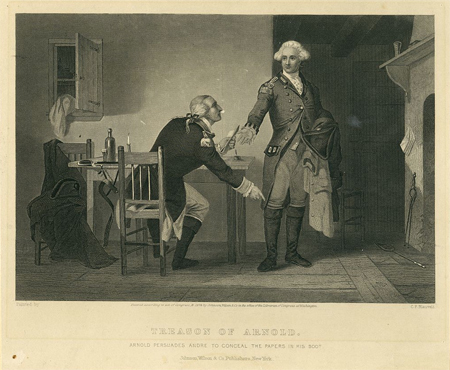 Although he avoided Major André’s ignoble fate and served in the British Army, General Arnold was shunned by British officers as a traitor and, to this day, the term is used synonymously with his name. Learn more by visiting the Today in History section, then click the links below to discover related resources.